Ship of the Line (1938), also known as A Ship of the Line, is C. S. Forester’s seventh Hornblower novel by chronology, second by publication. Hornblower, who seemingly encounters ridiculous drama every time he gets a new command, takes charge of Sutherland, a ship of the line, then sails off to conduct various raids on the French. self-serving and dishonorable. Forester got a better handle on the character in later novels, but for the modern chronological reader it certainly appears that Hornblower is evolving into a despicable man of low character in his old age. Most of Ship of the Line is action, but none of Hornblower’s adventures in this novel are particularly remarkable. Capture a ship, sink a ship, attack a fort, weather a storm – been there, done that. There’s no real plot here; it’s just attack, attack, attack. And is Hornblower the only man in the Royal Navy who speaks Spanish? Really? This isn’t the first time Forester’s given the reader that impression, either. And again, a careful reader who has gone through the series chronologically will notice more events that Forester later retconned. 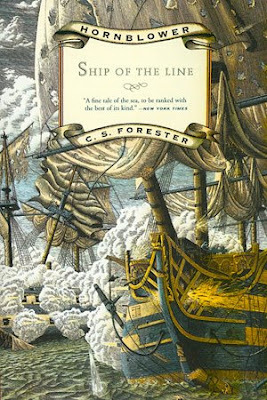 Ship of the Line is a tremendous disappointment, especially given the superior Hornblower novels Forester wrote after it. It ends with a cliffhanger, so you really can’t skip it, but it’s easily the worst book in the series to this point in the chronology.